The Island of Mistreated Toys – AiPT! Star Wars mixing with GI Joe, professional wrestlers brawling with Ninja Turtles, or Mr. T fighting Michael Knight could happen on any given day in my bedroom. “If I only knew then what I know now” is a common refrain that everyone sadly tells themselves. Like most kids, I loved my toys. I would bother my mom until she got me whatever action figure or vehicle I wanted and would be the happiest kid in the world if she was able to get it for me. And I was not one of those kids that would make my mom say, “You cried until I got it and now you never even use it.” I played with every single toy I had. Star Wars mixing with GI Joe, professional wrestlers brawling with Ninja Turtles, or Mr. T fighting Michael Knight could happen on any given day in my bedroom. Despite the fun and memories my toys provided me, I did not treat them well. Children have lots of great qualities but taking care of things is not one them, so maybe I should not be so hard on myself. After all, I still have many of them. After recently looking at them though, I realized that toys are not for kids. The cards I have are in great condition. Probably because I never played with them. Star Wars figures and collectibles are an entire industry unto themselves and it is not surprising to hear an unopened Han Solo sell for thousands of dollars. 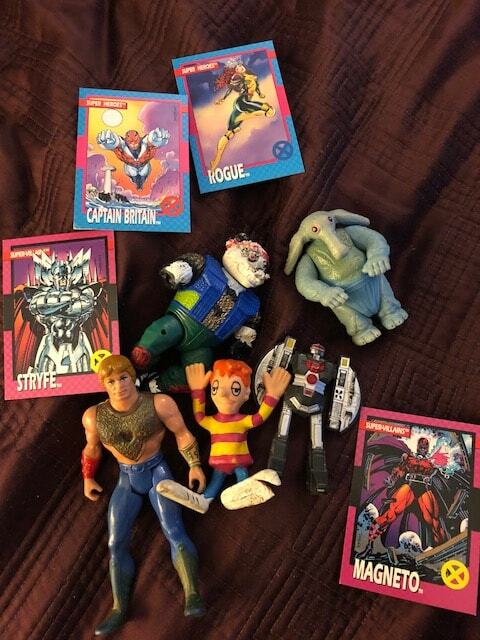 I had so many figures when I was a kid. Darth Vader, Royal Guards, various versions of Luke, Admiral Piet, and the Max Rebo Band for some reason. It was quite a collection. I sent them out on so many adventures over the years. Tough, unspeakable adventures. G.I. Joe was also a big part of my childhood. Sure the shows were little more than glorified cartoons, but when you’re six years old, you don’t care about all that. They were the perfect weekday afternoon fare. The figures were okay. Even as a kid, I felt they were kind of cheap compared to Star Wars figures. They just seemed so flimsy. The best thing about G.I. Joe were the vehicles. There were so many and they were much bigger than their Star Wars counterparts. But they were also very expensive. Luckily, my mom got me a couple.. As an adult who pays bills, I want to go back and have a long talk with young me. Robotech remains one of my favorite animes of all time. Unfortunately, there were no Robotech toys where I lived and just cheap knock offs. Thankfully, I had a back up. I loved Voltron and for some reason, my mom did, too. She was more than happy to get all five lions for me and my sister. And she didn’t just get the cheap plastic ones. She went out and got the die cast metal Voltron. To this day, this is probably the coolest toy I have ever owned. My mom only asked one thing: that I take care of it more than any toy ever. I happily agreed. And yet for some reason, I chose to never open the package for this guy. Toys are an important part of growing up. They help build imagination, form lasting memories, and most importantly, are fun. Unfortunately, they also require care that children do not comprehend. The good thing about today’s world is that there are plenty of other outlets for fun like video games and YouTube. As I have grow older, I have learned it is best to leave toys to the adults.